A quest to catch up with the moorhen family at nearby Reffley pond this afternoon provided us with some intimate moments of family life. As soon as we arrived, I spotted one tiny black baby standing in the nest the birds had made amongst the branches of a tree which had toppled into the water from the island. It was soon joined by one of its parents and then, gradually, I saw one or two more babies clamber up the branches out of the water and disappear under the parent’s wing in the nest. 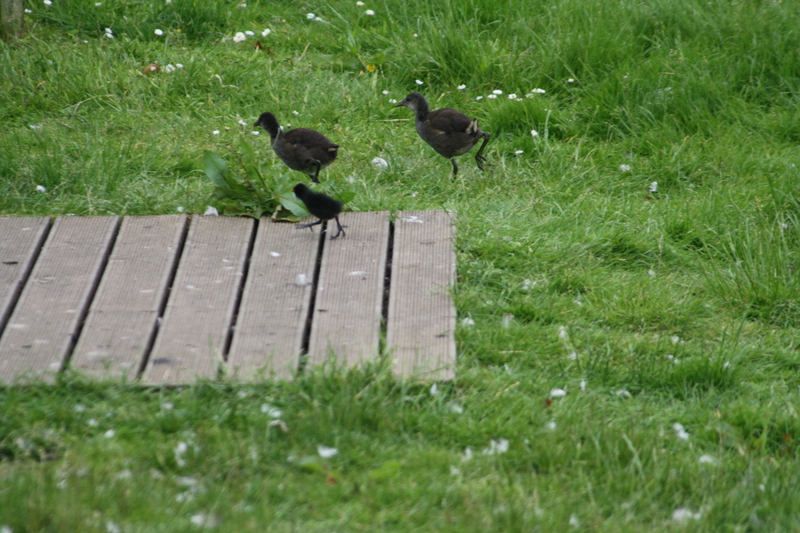 Some of the older moorhen youngsters from earlier broods carried on swimming about in the pond. After a few minutes, the group in the nest broke up. I saw one little head appear from under the adult, and then another, and they started to clamber back out into the water. I guess they had become hungry again after their siesta, for tthey were soon out swimming in the pond, following the older family members. Two of the babies and an adult appeared at the edge of the pond and then slowly made their way out into the grass and wildflowers. Every now and again, the adult stopped and popped a titbit into the babies’ beaks. The babies certainly looked tiny amongst the grass and the group didn’t go far from the pond. They made their way back to the pond and the adult and one baby slipped back into the water but one baby got left on the pond edge, which is quite high up above the water level. It wandered back and forth along the wooden edge, and peered out once or twice as if wondering what to do. Then it, partly accidentally I think, semi slipped down a wooden ramp into the water. I think we all breathed a sigh of relief! In the pond, I saw babies interacting with the adults: their little legs must have to go so fast as they swim along after them! 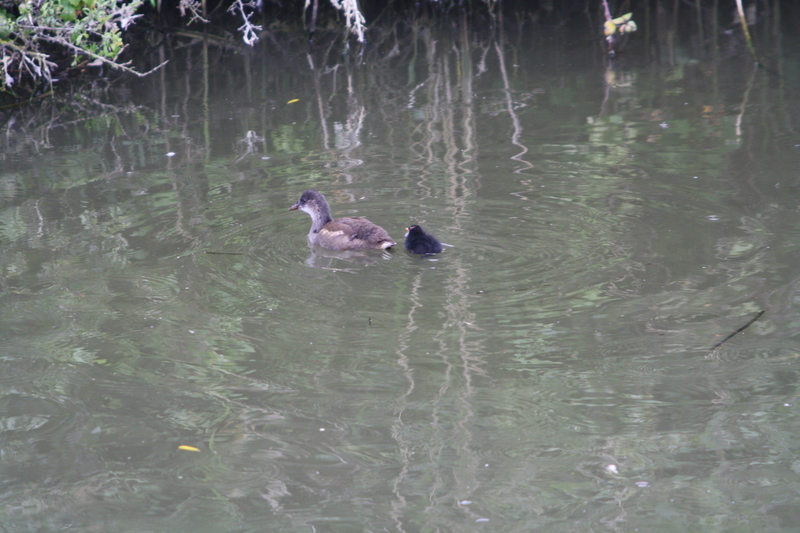 One teenager dipped its head in the water and offered food to a black bundle which then followed it very closely across the pond, providing clear evidence of how the older youngsters help care for the babies in moorhen society. 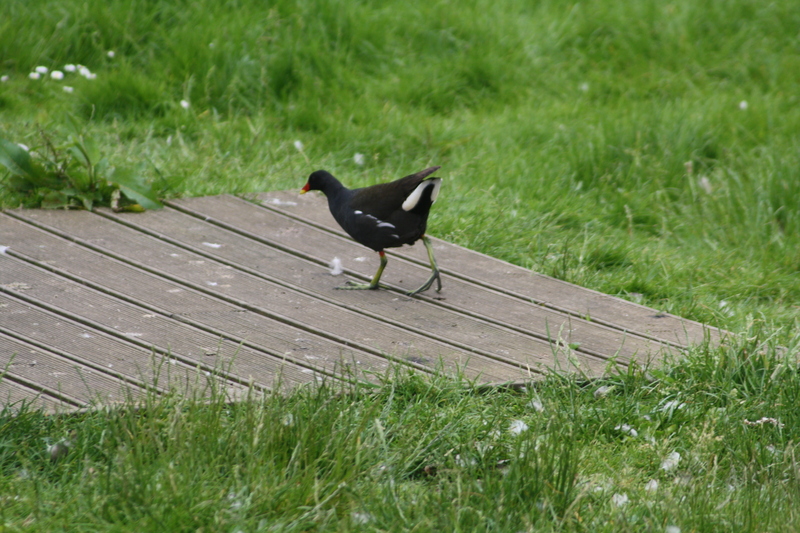 Moorhens have very long legs and feet and the babies’ feet are showing this already. Moorhens are in the same family as coots (the crake and rail family) and their babies look very similar when they are very small – black with red on their heads. As they develop, however, the moorhens will have a white line on their flanks and white under their tails, whereas the coots never show such markings. We have also been lucky enough to see a coot family grow up this spring at nearby Reffley Reservoir. I think this could be the third moorhen brood to start life in this pond this year. Today, we saw two adults, seven juveniles and five little ones. They certainly seem to do well here. PS: Be sure to look at the captions hidden under the picture story strips!